Rumble Strip Construction: Retrofit Existing Shoulders or Wait Until the Next Resurfacing? Some states, when initiating their rumble strip programs, made a quick decision to add rumble strips to each resurfacing project and left it at that. Today, however, most state department of transportation offices have abandoned this incremental installation of rumble strips. A typical rumble strip project today will retrofit 300-1,500 shoulder miles of existing highway shoulders with rumble strips (25 lane miles x 4 shoulders = 100 shoulder miles). Prevent hundreds or thousands more injuries and lost lives versus the incremental benefits when done with resurfacing. Most states can retrofit their entire interstate systems with rumble strips in one or two years, instead of the 10 or 15-year cycle necessary to resurface all the shoulders in the state. That means rumble strips installed as part of a large retrofit project will save lives 10 or 15 years sooner than if the state waited until all its shoulders were resurfaced. Vastly improve quality control. One or two inspectors can carefully scrutinize a statewide retrofit project. This allows for more manageable quality control versus 20 inspectors overseeing 20 resurfacing projects each with different contractors and subcontractors, in any given year. Nearly all quality control failures on rumble strip projects occur on resurfacing jobs, and not large, rumble strip only projects. Reduce Unit Costs by over 50%. The smaller the project, the higher the unit costs. Taxpayers not only pay twice as much as they should, but the high costs also open the door for inefficient, makeshift rumble strip mills that produce ineffective cuts or even damage highway shoulders. We Have Finished Retrofitting Our Shoulders With Rumble Strips. Now What? Some states that have already retrofitted their existing shoulders with rumble strips nonetheless have continued their policy of not re-installing rumble strips as part of resurfacing projects. Instead of reinstalling the rumble strips as part of the next resurfacing project, some states let a single statewide project to construct rumble strips along all the highway shoulders recently resurfaced throughout the state. This way, states such as Connecticut have seen their unit costs drop by half while eliminating their quality control problems at the same time. Is Retrofitting Really Less Expensive Than Resurfacing? On larger retrofit projects with 300 or more shoulder miles, states can expect bids of $700/mile ($0.13/cut) or even less. This unit price includes the construction, the clean up of the debris, traffic control — everything. 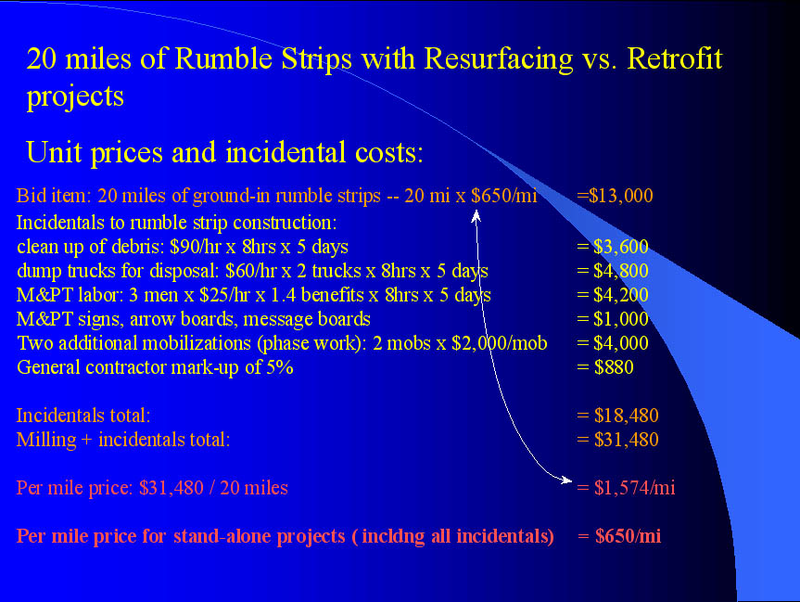 If your state currently includes rumble strips as part of resurfacing projects, you may notice bid tab pricing as low as $530 ($0.10/cut) or less. At first glance, your bid tabs may indicate your state is paying the same or sometimes less to construct rumble strips as part of resurfacing than it would for a retrofit project. It isn’t. Many highway authorities use rolling start dates on their construction projects, giving the contractor a 3-6 month window to begin work. Once construction starts, the contractor is held to a strict, uninterrupted construction schedule, usually requiring 8-10 miles of cutting per day. Most rumble strips contractors cut at a pace of about 10 miles in an eight-hour day. With a single crew, a 400-mile rumble strip project will take only 40 construction days to complete. So while the construction quantities appear large, the construction time is short. Rolling start dates ensure the most competitive bidding for the state. A relatively small number of rumble strip contractors work on projects throughout the country. States that set a specific start date risk choosing a date when few contractors are available. Not only would this result in high prices, but a state could find itself receiving bids only from inexperienced contractors with untested equipment.